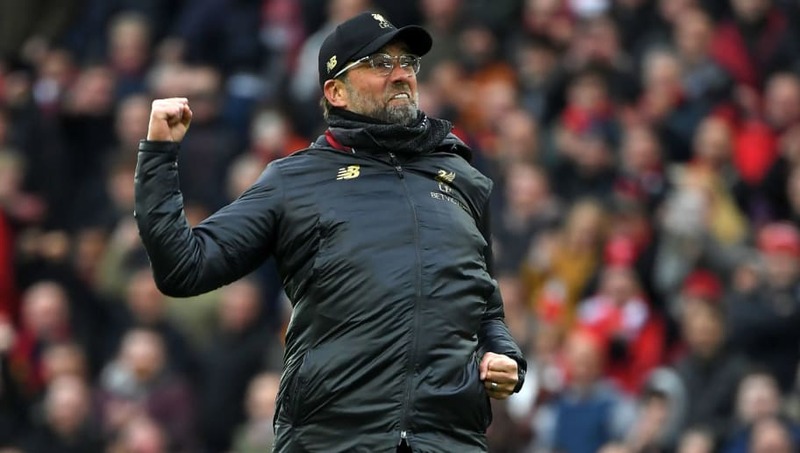 Jurgen Klopp was all too happy to heap praise upon his Liverpool side after they returned to the top of the Premier League table with a 2-0 win over Chelsea on Sunday. Two quick-fire goals at the start of the second-half proved to be the difference between the two sides, with Sadio Mane and Mohamed Salah both getting on the score sheet. ​Liverpool notably stepped up their game after the interval and Klopp pointed out what he changed to get the best out of his players. "In the first half we were a bit left-dominant, we had too many balls there," he said, as per Liverpool's ​club website. "That was one of the things we spoke about at half-time and it was wonderful that we scored a goal from that situation, Hendo in the box chipping the ball – a fantastic goal. The second goal was a nice strike from Mo obviously, a fantastic goal as well. "It was a fantastic performance, an even better atmosphere and a very, very important result." ​The win puts Liverpool ahead of ​Manchester City in the table - although the Citizens still have a game in hand over the Reds - but Klopp was keen to keen to take each game as it comes rather than look too closely at the big picture. "We see it game by game. We go to Porto now, which will be a tough one, and we will play there as good as possible. "Then we play Cardiff and everybody knows they fight for [staying in] the league, everybody knows it is a tough place to go. We go there and we will try everything to win there.